Blood, Sweat and Pixels Journalist Jason Schreier walks readers through the development of 10 recent games, finding marked similarities in the essential infrastructure of their design and production. Stories of marvelous achievement may earn our admiration, but they tend to follow the same trajectory, hitting all the same pious stations of the cross along the way: hard work, determination, never giving up, blind luck. There's a performative virtuousness to the success story, alongside the tacit assumption that its audience will of course seek to adopt its espoused virtues as a set of instructions in their own endeavors. But it's always the same instructions, the same virtues; hear enough rags-to-riches stories, and you'd be forgiven for wishing that successful people would, occasionally, put a sock in it, and let the rest of us poor indolent wretches go about our comparatively miserable lives in peace. Stories of failure, on the other hand — real, abject, soaring failure — may be much more common than tales of success, but each one is distinctive, idiosyncratic, highly personal, and thus, entertaining as hell. It's not simply schadenfreude. (Well, it's not entirely schadenfreude.) It's that failure is, more than anything else, deeply familiar, with a smell as warmly recognizable as that of a favorite coat — it's our smell. You think about this phenomenon often while reading journalist Jason Schreier's Blood, Sweat, and Pixels, a series of portraits chronicling the turbulent process of video game development. It goes a long way to explaining why the chapter on the ignominious Star Wars 1313, a long-delayed and ultimately scuttled game in which the player was to assume the role of a bounty hunter in the Star Wars universe, is a lot more fun to read than the chapter on Uncharted 4, the bestselling conclusion to a bestselling video game franchise. It's why the section on the release of Diablo III, a dungeon-crawler in development for a decade, is such a cringeworthy hoot: Famously — infamously — its rollout got bolloxed when unanticipated demand for the game crashed the developer's infrastructure ("The servers are busy at this time. Please try again later. (Error 37)"). Schreier describes engineers at the studio's headquarters "freaking out" while the rest of the development team, oblivious to the mushrooming disaster, were off celebrating the game's release at an off-campus launch event. 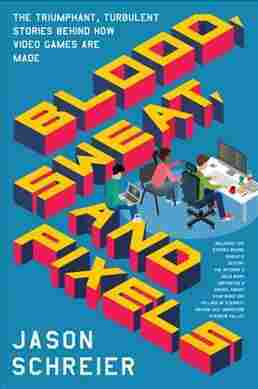 Again, given the essence of contemporary game design, Blood, Sweat, and Pixels quickly becomes a book about The Crunch — the months leading up to a game's launch, during which the staff works long hours over weekends and holidays to meet the deadline. Vastly different developers of various sizes, working on a wide variety of game designs, greet The Crunch in exactly the same way — by churning out the necessary code with a kind of communal, masochistic pride. He also clearly respects these developers and their achievements, and treats their rueful tales of selfless struggle with an admiring deference one sees among civilian guests at the American Legion. There are times when the reader hungers for a more critical, or at least more objective eye, as when Schreier feels compelled to include a quote like, "But at this company, [we] all want to create the best games out there. And we are driven by challenges, [even] a huge challenge which is almost impossible to do." That's the kind of empty, anodyne non-thought that could get trotted out in a post-game interview with an athlete, after "We gave 110 percent" but before "We just needed to get some points on the board." It adds precisely nothing, and only contributes to the book's vague tone of boosterism. There's another book lurking beneath the surface of the one Schreier's written, which ditches such blandishments and tackles the culture of gaming — and gaming development — with a saltiness that would provide real insights into its easily wounded, boys-only (or at least, boys-largely) ethos. To be fair, that's not the one Schreier set out to write. What he's produced instead offers a useful survey of the landscape of game production at this cultural moment, if you're willing to accept its argument that the industry's every bug is, in fact, a feature.